In need of a helping hand? Whilst the mornings and evenings are still light, autumn is starting to close in on us and a crisp chill is in the air. Around this time of year our skin often suffers a bit of a blow. Just like floating back and forth between the summer heat and air conditioning doesn’t do the body any good – the transition from summer to autumn often plays havoc with our skin as our bodies struggle to get used to the change in climate. The decrease in average temperature can often result in our skin feeling increasingly tight and dry – especially our hands which are often the very last things we think about despite the fact we use them heavily throughout the day. 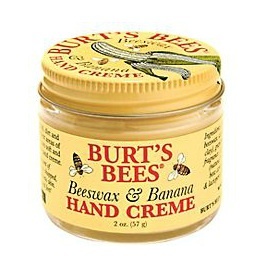 This cream has a gorgeous light summer banana scent but its beeswax and aloe vera content mean that it is also super rich and creamy to keep the hands soft and protected from the elements. In addition to being a great cream for keeping the hands feeling soft and smooth, this formula also improves the barrier function of the skin so as to minimise inflammation & environmental aggressors that lead to the development of dark spots. The spot correcting cream will also improve the clarity and brightness of the skin for a more youthful appearance. Whilst this is the most expensive of the bunch, this gorgeous scented cream can be used on the body as well as the hands, offers more product and really does feel like a luxurious treat. The formula itself is light and delicately fragranced so perfect for those who like creams that sink in fast and don’t leave behind any residue.